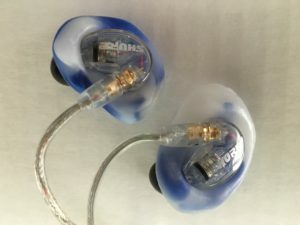 Are your ear-bud type In-Ear Monitors constantly slipping out? Using the In-Ear Monitors you already own, I shape a piece of non-toxic thermo-plastic and attach them to your In-Ears. With instructions and a video you can custom fit these to your own ears, like in the picture here, for UNDER $100! NEW!!! Two options available now! *** The first option is the safest, and the one I guarantee. I've already made all the mistakes, so I save you the hassle and the time. The second option is for those who weren’t comfortable sending me their IEMs, or for those that can’t be without them for a week. The reason I recommend sending them to me to attach the molds to your IEMs, is that this is the stage where it can get messy... BUT, if you choose this new option, I will help over the phone. Let’s talk about your needs. You simply heat with a hair dryer until the plastic is soft, and follow the instructions to achieve a perfect, air-tight fit! All for UNDER $100! Many colors are available... and they can be re-molded as many times as you need! Click on "About" to learn more or Click "Shop" to order! • Mike O'Neil (Michael is a world renowned guitar player/producer/writer-has played with George Benson for over 30 years, as well as with Stevie Wonder, Rickie Lee Jones, Natalie Cole...and many, many more. He has also scored many shows for several networks including Bravo, BET, Animal Planet, NatGeo as well as several movies).